Holy Comforter 2020: Get Involved! You’ve read the packets. You’ve heard the appeals from the pastor and lay leaders. You’ve browsed our mini-site dedicated to Holy Comforter 2020. Now you want to get involved. Great! The Church is not fulfilling its mission without an active, engaged and spiritually formed laity. Below are opportunities to sign up for projects or new ministries we plan on creating as part of this initiative. Some may only take a couple hours of your time. Others may require a deeper commitment. Pray about what God may be asking you to do for this parish and His Church and then sign up by entering your name on the linked forms below. More opportunities will be added soon! Sign up here if you can help us add to the beauty, functionality and safety of our physical church structure. You don’t have to be handy, just be willing to put in some time and effort! Read more about our work in and around the church here. Organize a group pilgrimage – Sign up here to help us organize a trip to the Shrine of St. Katharine Drexel in Palmyra, the St. John Paul II National Shrine in D.C., the Shrine of St. Elizabeth Ann Seton and/or her grotto to Our Lady of Lourdes in Maryland… or any other holy site! Improve communication between the parish and those who are homebound – Sign up here to help us reach out to the ill, infirm, elderly and homebound! We already have lay ministers who bring communion to those who cannot make it to Mass, but we want to do more to ensure that these parishioners feel truly connected and part of our community! We may also seek ways to publicly recognize older parishioners on significant milestones such as birthdays and wedding anniversaries. “Holy Comforter 2020 Festival” – Sign up here to help us organize a festival in 2019 or 2020 as the “crowning event” to celebrate the anniversary of our parish and the Diocese. We could work in conjunction with St. Thomas Aquinas and/or Incarnation for this. Recall that 2020 is also the 200th anniversary of the Richmond Diocese. This festival could be a major social gathering for all central Virginia Catholics. Or we could limit it to our own community and perhaps include Incarnation, which was once a mission of ours, and the Crozet Mission Community. Parshwide dinner/fundraiser – Sign up here to organize a dinner and fundraising event to bring our parish closer together and help pay for all of the wonderful improvement projects we are undertaking. 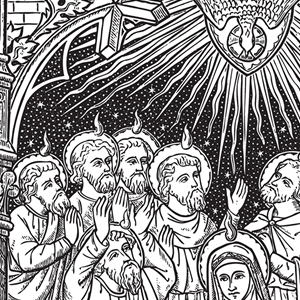 This could (but does not have to) be done annually, and perhaps around the time of Pentecost as a way to ensure that everyone celebrates our parish’s feast day. Offer regular welcome receptions for new parishioners – Sign up here to get involved! Catholic churches have, at times, found themselves at a “welcome deficit” compared to our Protestant brothers and sisters. Developing a program that helps quickly make new parishioners feel at home at Holy Comforter is critical to keeping people in the church and improving engagement.